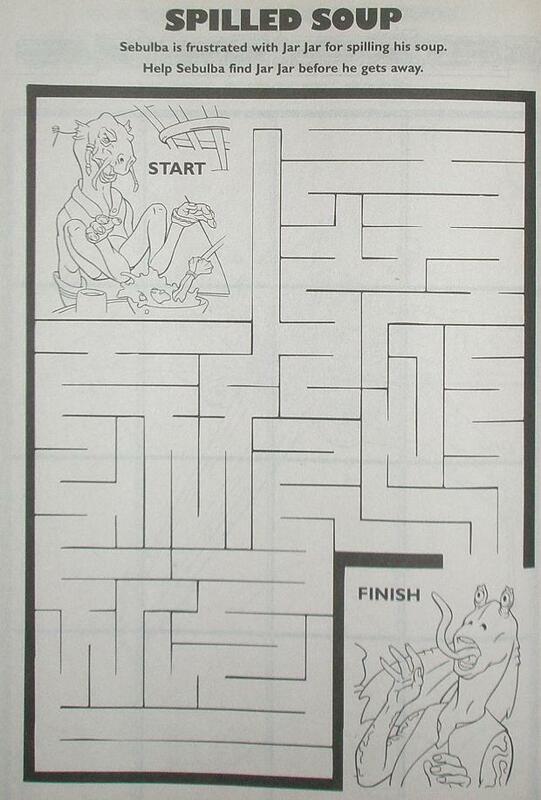 This maze is based on a scene part way through Star Wars: The Phantom Menace after the group ends up on Tatooine when Jar Jar Binks does something stupid and spills Sebulba’s soup. Sebulba is prevented from exacting sweet revenge on Jar Jar thus allowing Jar Jar to continue subjecting viewers to more irritating and stupid scenes that include him. However, in the Star Wars coloring book, you have the opportunity to help Sebulba get Jar Jar for spilling his soup. This is odd because usually a maze like this would involve helping a good guy like Jar Jar get away from a bad guy like Sebulba. The publisher of the book was fully aware that page would go unsolved if that was the case so they made it something people would want to do. Of course, what Sebulba does to Jar Jar at the end is limited only by your imagination and it doesn’t need to be limited to one outcome. You can imagine all sorts of ways Sebulba would punish Jar Jar for spilling his soup. In fact, it doesn’t even need to have a reason like spilled soup. Sebulba can just be going after Jar Jar because he is Jar jar.